A pinch of toasted cumin. A hint of ginger. A warming sprinkle of cinnamon. When you begin exploring the world of purees or finger food, you’ll come across many safe spices for baby that can enhance the flavor of food. Bland baby food isn’t necessary. Or fun. And with the right spices, you can bolster your little one’s digestion. This list of spices is not comprehensive. There are a lot of spices – like leafy green ones – that are safe for baby, flavorful, and work their own kind of magic. The spices listed here are common baking spices that you might find in a traditional pie or your favorite seasonal latte. When added to purees and finger foods, they will benefit your baby’s digestion. Especially if there’s a history of colic or gas. Dried ginger – not fresh, which is better suited for shooing the sniffles away – warms digestion. Because it’s so warming, dried ginger is fabulous in smoothies. If your baby eats too much food that is cold in nature – like sheets of seaweed, salmon roe, or slices of watermelon – your baby may throw up. And the warming properties of dried ginger can help soothe digestion. Cinnamon warms the body, gets rid of cold, and moves blood. Because of this, it has the potential to get rid of abdominal pain and gas. Researchers have even found evidence that cinnamon is a strong anti-microbial and it can help manage Candida overgrowth. When shopping for cinnamon, look for Ceylon or “true” cinnamon. Nutmeg is what’s known as an astringent spice. It has the ability to “bind” the intestines, helping to manage chronic loose stools and diarrhea. Because it’s warming, nutmeg also can help relieve gas, abdominal pain, and poor appetite. Clove is another spice that warms the interior, helping to get rid of diarrhea, gas, tummy pains, hiccups, and vomiting. And like other warming spices, the essential oils in clove have a knack for targeting microbes that are less-than-awesome for our health, like Candida yeast and drug-resistant bacteria. While cardamom is warming, it also has the ability to move any sort of stagnation in the gut. This can mean belching, indigestion, gas, and tummy aches. Warming and pungent, cumin promotes digestion and relieves gas. Bright yellow and full of curcuminoids, turmeric is notoriously anti-inflammatory. It contains curcumin, which scavenges free radicals. It also regulates the immune system and protects the liver. There’s even some evidence that turmeric acts as an antifungal against Candida. According to Chinese medicine, turmeric is a mover. And this can be a good thing for babies since they’re said to have weak digestion along an excess of liver energy. While you can certainly use each spice individually – my favorites are ginger, cinnamon, and cardamom – this recipe combines the spices above into a baby-friendly curry powder. 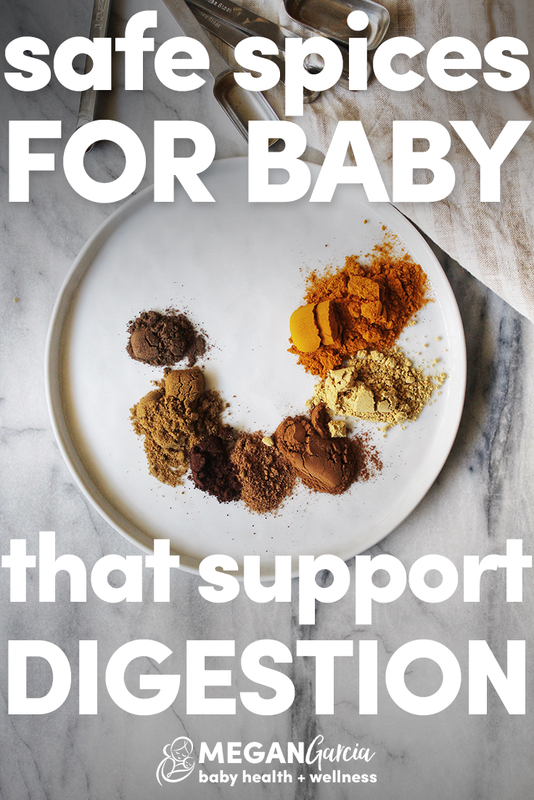 The focus here is on baby’s digestion and I’ve left out hot spices like black pepper (even though it can be mild and sometimes beneficial) and chili pepper. When you can, shop for organic spices. And because ground spices tend to lose their flavor with time, whole spices (ground at home with a coffee grinder) taste better. That said, I’ve got a whole drawer full of pre-ground spices and I use them every day. Heat tends to enhance the flavor of spices. If using whole cumin, try toasting it in a dry skillet for a minute or two before grinding (#gamechanger, you guys). When cooking for baby, start by sauteing aromatics like onion or celery. Then sprinkle with baby curry powder. Allow the flavors to open up before adding the main ingredients. How to use: When making a small amount of food – for example, one medium-sized sweet potato – I will use about one tablespoon of high-quality fat with 1/2 teaspoon of curry powder. 1. Place all spices in a jar. 2. Give it a shake.